Save $5 when you spend $25 or more at Rexall stores. Save $2 on NUK pacifier or NUK cup. Save $2 on Dove Men Sportcare product. 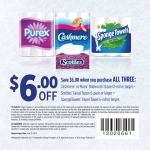 Save $1 on Softlips product. Save $3.50 when you buy 2 Incognito Nano tampons, 16s or 32s. Save $1.50 on Incognito Nano tampons, 16s or 32s. Save $5 when you purchase 3 Hallmark cards.